People who haven’t been to Walt Disney World or Central Florida sometimes think that it is consistently sunny and comfortably warm year-round. Well, it isn’t. Summer days are typically stiflingly hot and humid. But while winter rarely sees snow, or (more common, but still rare) temperatures below freezing, there’s so much variability in winter temperatures that a visit then may be loaded with perfect days or full of shivers. Officially there’s just two seasons in Orlando, the dry season from October through mid-May, and the wet season the rest of the year. But below, I divide the year into four seasons, based on common and consisted weather patterns. For convenience, they have the traditional labels—but because they are about Orlando, they don’t match the astronomical date of the season! For example, “Fall” below is not September 22 to December 21—it’s the latter three weeks of October! Orlando is dryer—with less rain and less humidity—these months. Temperatures on average are cooler, but are also highly variable. Typical highs are in the 70s, but highs in the 30s are not uncommon, and record lows are below 20. December, January and February are the coolest and most variable of these months. Best for: those seeking to avoid the heat and humidity of summer. Worst for: those for whom extended time at the pools and waterparks is an essential part of their trip—there’s too much variability to be sure of lots of great warm days. During this time of year Orlando is hot, wet, and humid. High temperatures are typically around 90, and show little variably year to year. High humidity makes the heat tougher to bear, as it limits the ability of sweat to cool the body by evaporating. June through August is the worst. 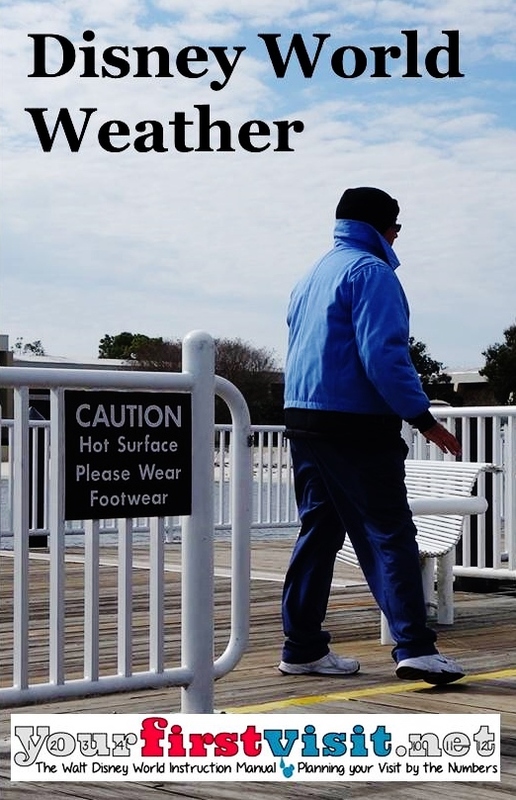 You’ll see more comfortable days before and after–particularly in May but also sometimes in later September. Brief late-afternoon thunderstorms are common, happening almost every day, and multi-day storms are possible. The hurricane season officially runs from June 1 to November 30, but it has a clear peak from late August to early October. When the heat and humidity are at the upper end of their typical ranges, it can be so uncomfortable that you don’t want to leave your room. The common approach to summer is to hit the parks early and late, and stay out of the mid-day heat. In years with an early Easter—pushing spring break crowds into March and early April—the second half of April is one of the absolute best times to go to Orlando, from the combined perspective of crowds and weather. The late Easter in 2014 makes these dates unwise. The peak of the hurricane season ends in early October, and after that October weather is almost as nice as in the spring. Later October is a little warmer and wetter than April, with some continuing small risk of hurricanes, but still a favorite of many. 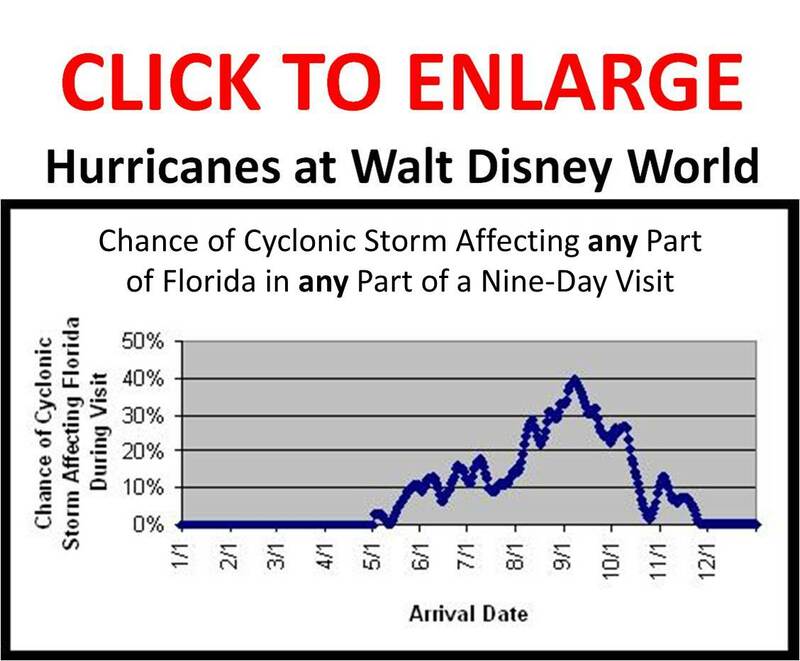 I’ve been getting a lot of questions and comments about the potential impact of Hurricane Katia on Walt Disney World. As I update this Tuesday morning 9/6, long range forecasts for Katia don’t predict an impact on Florida. They show Katia curving away from the US coast and remaining out to sea. Weather.com has an overview of Katia here, and the Orlando Sentinel has one here. For its cone of uncertainty for tropical storms and hurricanes, click here. For more on hurricanes at Walt Disney World, see this, and for some basic precautions see the lower part of my tornado page here. 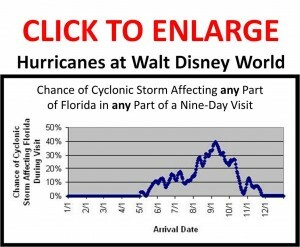 I’ve been getting a lot of questions and comments about the potential impact of Hurricane Irene on Walt Disney World. As I update this Thursday morning, it looks like Irene will cause little to no trouble at Walt Disney World. Weather.com has an overview of Irene here and an Irene threat level map here. Over this week, as the projected track has moved further east, the threat level for Orlando has moved from “medium,” to “low” to none. The current expectation is for possible rain and wind gusts Friday morning. Check the links above or below for up to date forecasts. The local paper, the Orlando Sentinel, also has good info. Storms like this are usually not a severe issue for Walt Disney World. Even if they pass right over Disney World, their journey over land to Orlando dissipates their energy and makes them more like a really bad thunderstorm than like what most people visualize as a hurricane. But things change, so stay up to date with the links, especially with the Irene threat level map and its cone of uncertainty. Although hurricanes get much more attention, tornadoes are likely an equal threat to central Florida visitors—although neither is a major risk. Winter/Spring tornadoes are a particular threat. If you can’t go to Walt Disney World the recommended week, or are just curious about weather patterns in Orlando, the following pages illuminate the weather in Orlando in the recent past.